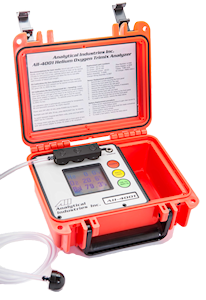 A portable Trimix Analyzer designed to ensure the correct mix of helium, oxygen and nitrogen for technical diving. This easy-to-operate diving instrument analyzes gas mixes, automatically correcting for environmental conditions and eliminating the risk of errors from manual calculations. It has a large backlit LCD display that is easily read even in low light conditions, and which provides additional information such as a Maximum Operating Depth calculation. The features make the Trimix 4001 one of the best nitrox analyzers on the market for diving oxygen analyzers. Power	 Rechargeable battery, 9 V DC from 110/220 V AC (can charge battery in 2 hours). Optional 12 V DC car charger.